Not all successful people’s hands are impressive (if one takes into account the whole personality) but Jose Mourinho (famous Portuguese football coach) is an exception. His hands are well balanced, telling us not just about his skill and ambition but also his objective thinking and reasonableness. The latter traits are present to a high degree and make this man exceptional. He will not be biased when it comes to taking decisions and will do so with a remarkably cool head and neutrality. say the CEO of Coca Cola. What is striking is the large area of his palm. Although fleshy, the shape of the palm shows breadth of vision, a high level of energy and plenty of common sense. The size of his hand confirms that this man will not let emotions and self interest cloud his judgment. He will not be petty, and will see issues from a bird’s eye view. All the more admirable as Mourinho is not cold or unfeeling. In fact he has strong emotions which are kept well in control. (Mars Mounts, thumb). The shape of his fingers and thumb point to managerial ability which all CEO’s should ideally possess. Such people are natural leaders, think fast, take quick decisions and have the ability to know how their decisions impact the whole. Their plans are always big. They are no-nonsense type of people, and also action oriented. Mourinho's hands show impulsiveness but it is kept in balance by the pronounced first and second knots on his fingers which indicate a thoughtful approach. They show that he has the ability to pick things to pieces, investigate and analyse. The strength of the Saturn finger shows an added prudence and caution. He is a planner. The tips of Mourinho’s fingers tell us that he is a level-headed and cool guy. He is not idealistic, but realistic. He is able to see his own faults and make the best of it. His Apollo finger and perhaps his Saturn finger could have a slight Spatulate tip. This gives him an originality of approach. His Mercury finger points to cunning diplomacy and clever use of words although his thumb indicates that he can be quite frank and outspoken when necessary. People with these signs are good communicators and know what to say at the right time. Mourinho's personality is such that he will use facts and figures to convince, not rhetoric. His originality and vitality of personality will colour his speech, giving it a touch of magnetism. His thumb shows leadership ability and a strong will. The way he holds his fingers and thumb tells us that Mourinho is a private person who keeps his own counsel. A clue to Mourinho's tremendous success is the profession he chose. He is unsuited to a desk job (shape of the Saturn phalanges) or number crunching of any sort. He also has a high level of energy and restlessness and if these traits are combined with his practical nature, leadership qualities and skill with people then managing a team is something he would excel at. Choosing the right job makes the difference between reaching the top and just being very good. Mourinho's ability to see issues and people (and himself) objectively enabled him to choose well. Read about the hands of Cristiano Ronaldo and other Sports Stars of the world. Thanks Vishesh. It's interesting to read the hands of those I know little about. It ensures that I am objective, in the sense that I don't search on the hand for known traits. The genius word you used in interesting. I think that when any good quality is present in a high or extreme degree it gives the owner the quality of genius. Lalit Modi needs to be the next personality..There is simply too many things about him that needs to be seen in the light of his palm. Lalit Modi has been on my mind too. I've collected some of his hand pictures though none are really satisfactory. Lets see what I can come up with. Maybe I can do a limited reading. 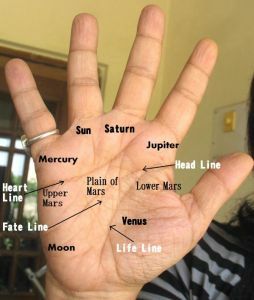 This palm reading is very interesting and I think it’s spot on! Do you know, that many people call Jose Mourinho arrogant? Yet, his palm says that he is able to see his own faults and is without self-interest! Thanks Margie. A public image is often something that can be misleading and it is the palm which reveals the inner workings of the mind. You are not rambling at all. Feedback is great to get! Thanks, I agree, knowing the inner workings of the mind of someone is very helpful to understand them and see past their public image... whether that public image is created by the public or by themselves--in the case of politicians, for example, I think they themselves often try to create a favorable public image of themselves... so I think that your palm readings of politicians are very revealing because of this. Also, can you do the hand analysis of Matt Mullenweg (Founder of WP) , Sergie Brin/ Larry Page (Founders of Google) - these guys and what they have done at a very young age is highly impressive! DI, this old post was sent to the subscribers by feedburner by mistake. I checked on the net and found out that feedburner has this glitch and has had it for years. You are a new subscriber and so you did not realise it. If any old subscriber is reading this again, they are going to be quite bugged! And yes you are right about the introduction. I at times realise it and then go back and write it. I think with Jose Morino, which Vishesh had asked me to analyse, I forgot to do it completely. And yeah, I will keep the names you have mentioned in mind and search for their photos. If I get decent ones I will surely analyse them. Margie, I have mentioned his weaknesses, subtly. He is lucky in the sense that he has self-control and a sense of balance in his personality which keeps his weaknesses in check. When I wrote he has "cunning diplomacy" you can read much into that phrase. He is a smooth character alright and it is likely that he plays mind games as you mentioned in an earlier comment. People don't like to be played and those who feel that they have been played will naturally dislike him. Although, I think that all football managers have a tendency to play mind games. They also tend to say that a player is fine when they are actually not, etc., or to be hypocrites... So, I don't think that his career helps him be any less cunning. In fact, compared to other coaches I see him as much more direct and honest. Margie, that's an interesting question. I studied his hands again and found out that it is not an inherited trait. He developed it. Usually personality changes happen when people are very young. They usually happen due to family circumstances. They develop because the child feels that it is necessary for survival. It is not necessary a bad trait and does not show a bad person. A lot of clever successful people have some amount of cunning or some would call it shrewdness. Such a trait is only bad on bad people but Mourinho is a good person. Thank you very much, and I agree he's a good person! Now that I think of it, cunning diplomacy probably only helps him more than hurts him in terms of worldly success. Maybe a perfect person would find it hard to be successful in this world.